Remember the zombie novel written on a BlackBerry? Pick up the latest addition free through Saturday! Many of us love our BlackBerry keyboards, but do you love yours enough to be able to write an entire book on it? Well how about not just one book, but two or three of them? CrackBerry forums member Jessica Meigs has taken to her beloved BlackBerry to write a series of books which she has titled The Becoming, and it even features the Michaluk virus (after our very own Kevin Michaluk). The series is about a group of people who are trying to survive a viral outbreak in the southwest of the United States. This edition, The Becoming: Brothers in Arms, can be read either before or after the first book, as it's a background story for some of the characters and won't spoil / require any previous or additional reading. If you are looking for something new to read on your BlackBerry PlayBook or BlackBerry device be sure to grab this novella while it is free on Amazon. 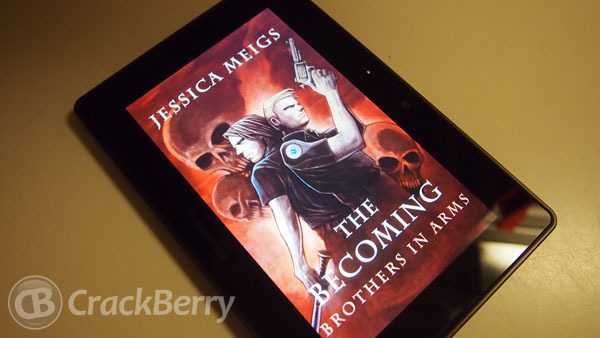 You can check out how to get the Kindle App on your BlackBerry PlayBook if you haven't already, and pick up The Becoming: Brothers in Arms at the link below. This novella is free through Saturday!